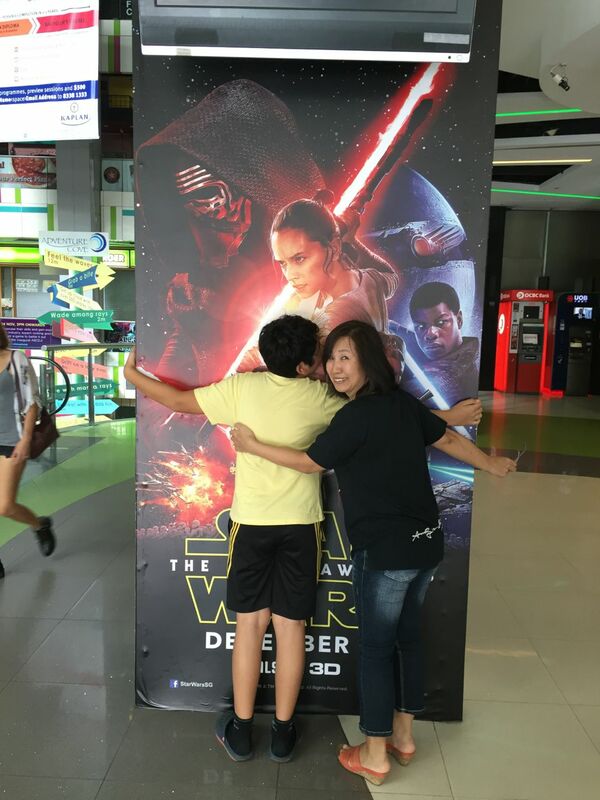 So, the day after we arrived back in Singapore from Sri Lanka, December 27th, the three of us finally got our look at The Force Awakens, Episode VII in the Star Wars series of films. Zen and I, big Star Wars fans, enjoyed the film tremendously, and even Naoko said that it was great (and she normally doesn’t like science fiction films). I was a bit troubled by a small number of things in the film; but Zen and I watched it a second time on December 31st, and those troubles were basically forgotten. I’m glad I saw it twice – it’s definitely a great film! The film starts off (like they all do) with the heart-stopping opening blast of trumpets, then the classic intro scroll – and nothing beats the feeling of seeing that for the first time (I’ve seen all of the Star Wars films in their original runs in the theatres, and that moment took me right back to the Sheridan Mall theatres in Mississauga, 1977, when I was eight years old, watching A New Hope with my 6-year-old brother and my dad, who took us there with great reluctance), it’s a great way to start a film off quick. We quickly find ourselves on Jakku, a Tattooine-like planet (and the first of many parallels to the original Episode IV-VI trilogy). There are a series of interesting battles, reunions, new encounters, Millennium Falcon chases, dogfights with TIE fighters, hints to the past, and ultimately another attack on another Death Star. Some have complained about this (one friend even expressed disappointment of the second Death Star in Return Of The Jedi, something I thought was pretty badass), but I was okay with it – after all, how do you top the ultimate weapon but to make an even stronger weapon?). Also, sneaking-around-Death-Star scenes always work well – spooky, haunted house, enemies-all-around-us kind of stuff – and the scene of the Millennium Falcon warping right into the shields was pretty darn cool after all. The scene that really won it for me was the final sequence showing the search for Luke, with its reference to the Earthsea stories of Ursula K LeGuin, and the fact that he doesn’t utter a word. I wonder how Episode VIII will pick this up! The movie is full of thought-provoking questions. Who is Lor San Tekka, described only as an ally of the Resistance, and what is the significance of his very few, cryptic but seminal lines of dialogue? What is Rey’s full name and parentage? And, since no one in the Star Wars universe meets randomly, what is Finn’s parentage for that matter? Who is Snoke? And why are there so many parallels in the Star Wars universe (there’s many in this film, but also others – both Luke and Anakin losing hands, for example… I’m just waiting for Kylo Ren to lose his – hasn’t happened yet, though)? Why does Rey get visions in Maz’s cantina on Takodana… and why does Maz have Luke and Vader’s light sabre anyway? Finally, why is Rey chosen to be the one to go find Leia’s twin brother (sure, it’s implied, but it also feels very rushed)? We also must wonder – what will Mark Hamill sound like once he opens his mouth (he could be perfectly awful!)? But the series has a lot going for it, based on the stuff established in The Force Awakens, and I’m picturing two tense new movies that take the series to a new level of depth – perhaps with Snoke as an ancient evil being to whom Darth Sidious and the Galactic Empire is a mere footnote. I’m not sure I really like Finn’s flawed character – he’s a turncoat, a coward (of sorts), a bit vain and a casual liar, and I don’t quite buy his blood brother-like friendship with Poe given their brief time together, but I’m optimistic that he’s going to turn out all right over the next movies. Finally, we will need to get closer to the answer to the real Star Wars question – who is Anakin’s father (forgot about that one already?)!? JJ Abrams has done an interesting job, blending the familiar (same actors, same must-stop-the-Death Star concept, same desert planet, same hiding of secret plans inside a droid, hiding in the floor of the Millennium Falcon, stalking the Death Star in order to disable it, observing the death of a beloved character from afar and screaming “NOOO!! !”) with the new (female protagonist, art film-ish intro to Rey’s life on Jakku among ruined Star Destroyers and AT-ATs, cliffhanger ending). It’s also interesting that he’s reunited two of the cast of the Coen Brothers’ Inside Llewin Davis – title character Adam Driver (Kylo Ren), and Oscar Isaac (Poe Dameron), who had a small part in the Coens’ film. There’s been a lot of backlash to the film, with people calling it a re-boot, and others calling it the least interesting film in the series (the entire first three films are less interesting, in my opinion, since we know how it all turns out); plenty of this stuff is click bait, and the articles don’t make compelling arguments. A lot of people also think that Maz Kanata is the worst character in the film and despise the new cantina scene, calling Maz an orange Yoda, or comparing her to the Oracle in the Matrix trilogy. Personally, I was more disappointed with Carrie Fischer, who couldn’t have been more stiff. As hot as she once was, she hasn’t taken care of herself over the years and is clearly in very bad shape. Harrison Ford, by comparison, hops around the set and has a lot more spark left, which is great – we get to see quite a lot of him in this film, and I have a feeling he’ll turn up in some form in following films! 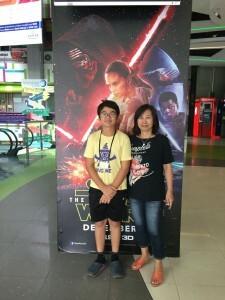 After I saw the film for the first time, I was quite annoyed at the crappiness of the chrome stormtrooper Captain Phasma, the wimpiness of Kylo Ren and the resurrection of yet another Death Star; but none of this mattered the second time I saw it, and I found the story flowed well with hardly a bump. I also came to realise the silliness of the conclusion of some that Finn and Rey could never have fought Kylo Ren to a standstill at the end – well, wasn’t he weakened and badly injured after taking a hit from Chewie’s laser crossbow? However, one thing still annoyed me – how is it that Rey can just try her luck and succeed with the Jedi mind trick, never having tried it before!? That’s quite a stretch, I think, of anyone’s suspension of disbelief. 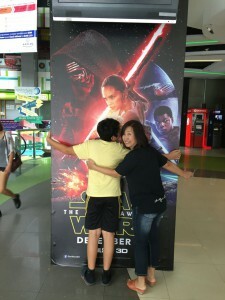 I was also quite captivated with Adam Driver as Kylo Ren – initially, I thought of Kylo Ren as a silly, but talented, adolescent prone to temper tantrums who fails more often than he succeeds, but now I see him as a complex character who is likely to ultimately sacrifice everything to become a Sith lord even more powerful than Darth Vader. He also seems to be a fine actor, as witnessed by the strange scene when Daisy Ridley resists his attempts to extract information from her (kudos to Daisy Ridley as well, of course), but we need to find out more about the source of his anguish before we can really tell about him as a character. My sense is that this is a relatively un-dynamic “foundation” film, sort of like the first Batman/X-Men/Iron Man movies, that need to get stuff behind it in order to get things moving with plenty of surprises in store for Episodes VIII and IX. Sure, Star Wars is now a Disney property – this can be a problem in the sense that there will be a big corporate tendency to maximise profits playing it safe, but the advantage of having big Disney money behind Star Wars is that continuation of the story will be at the hands of a publicly listed company with a strong management and access to a massive range of talent, and not based on the energy and whims of one man (George Lucas) who once envisioned nine films, but retired after three; the series, of course, was doomed to retire with him… until Disney came along. I never thought I’d say it, but… hooray for Disney! Of course, the problem with all of this is that building on all of these grand ideas will be a tricky task, and it could easily get very, very silly; however, there’s no doubt that Disney has its ear to the ground and has the opportunity to learn from fan feedback as it embarks on the next one. And, with Lawrence Kasdan’s involvement, the series is in good hands – Mr Empire Strikes Back may actually have the best track record of anyone in Hollywood for being attached with quality films (Body Heat, The Bodyguard, Raiders Of The Lost Ark, The Big Chill, etc).